Before creating a portfolio, it is good to create an advanced organizer, to identify the specific artifacts that I wanted to include in my portfolio. Below are three versions of my portfolio: the original Excel version, a PDF version, and a scanned copy of my original worksheet that was used to classify the artifacts. After selecting the artifacts, I tried to identify which competencies or skills each artifact demonstrates. I found five or six major categories right now, maybe more when I think about it. But the major categories have emerged. Now, all I have to do is create a collection for each grouping, and write an overall reflection plus record the captions. Since I had all of the artifacts on one of my websites, all I had to do was capture the URL. From start to finish this project took me an evening, and most of the time was spent in selecting the artifacts and writing the captions. Those aren't really technology issues...they are portfolio issues. I spent an evening in 2004 going through my web pages and my hard drive (my digital archive) to select the specific artifacts that I wanted to use in my portfolio. I set up this Excel spreadsheet that let me list the artifacts (21 in all) and then create hyperlinks to each URL. (If the artifacts are not online, then I would need to upload them as attachments.) If your browser will not open an Excel file, open the next version (in PDF). This document has also been uploaded as a GoogleDocs file. After creating the list with the URLs, I added comments in Excel to represent the captions for each artifact. I played around with converting the document into HTML, but spent too much time fighting the Microsoft style sheet codes. So I just converted the document into PDF, which I will use on the WWW. I uploaded the Excel spreadsheet to this portfolio as a document, but I might prefer using the PDF. 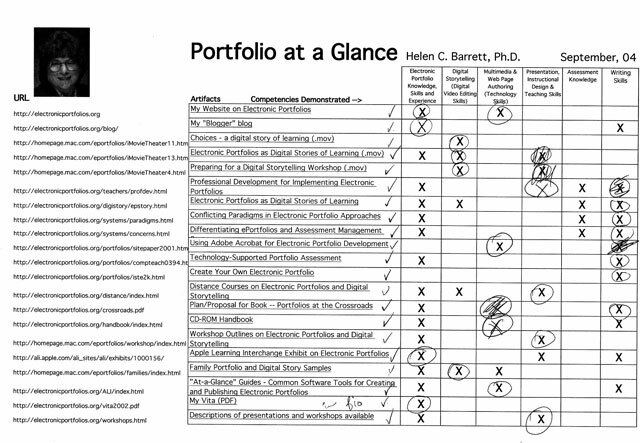 This is a scanned version of the actual worksheet that I used to categorize my artifacts in 2004.